This tool is best experienced on your desktop computer. Please be patient as the data server loads while you explore. Climate change is one of the great threats our natural world faces today, so why doesn’t the U.S. government track greenhouse gas emissions from federal fossil fuel production that occurs on public lands? The lack of effort to record and understand climate emissions is astounding given that the federal government is one of the largest energy asset managers in the world. Limited data leaves Americans, the owners of public lands and shareholders of federal energy resources, in the dark on the extent to which fossil fuel emissions from public lands are contributing to rising global temperatures. In absence of government oversight, The Wilderness Society has started to track and calculate emissions data, using various government sources, including data from the Office of Natural Resources Revenues (ONRR) and US Extractive Industries Transparency Initiative (USEITI). 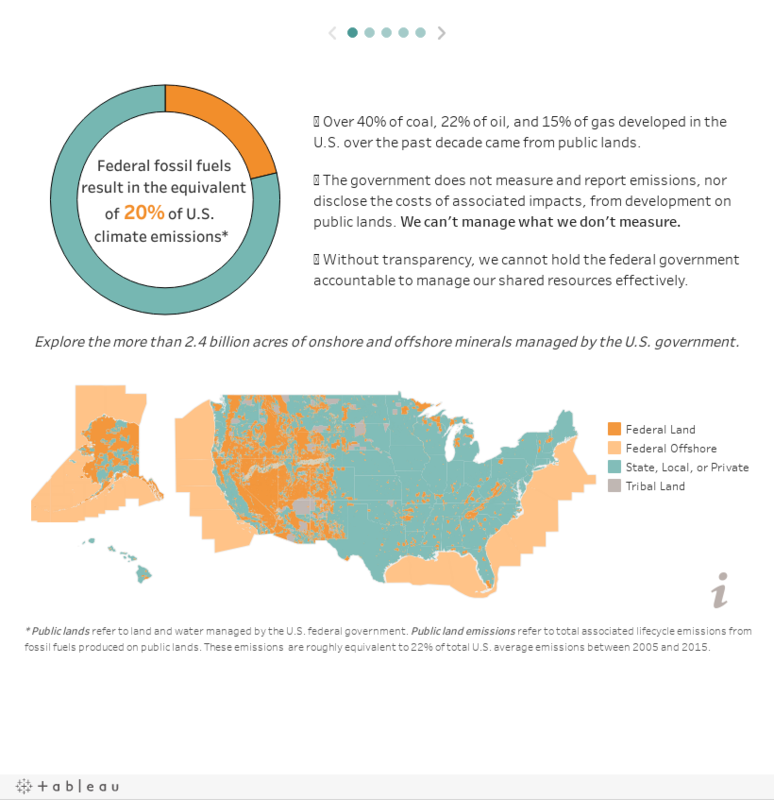 Greenhouse gas emissions associated with oil, gas, and coal from public lands are equivalent to one-fifth or more of total US emissions. Our accompanying report In The Dark: The hidden climate impacts of energy develop on public lands also explains more about why the federal government needs to inform its shareholders (the American people) when managing their assets (energy resources on public lands) .